In modern, competitive economies, knowledge-based innovation is the foundation for economic development. Sustained growth and improved living standards can only be obtained by increasing productivity and introducing new and better products and services that compete successfully in the global market. 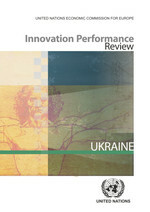 The Innovation Performance Review of Ukraine continues the series of national assessments of innovation policies initiated by the earlier Reviews of Belarus and Kazakhstan. These policy advisory exercises draw on the experience accumulated by the UNECE in the identification of good practices and policy lessons in the area of knowledge-based development, with particular reference to the problems of countries with economies in transition. This Review presents the outcomes of an advisory project undertaken at the request of the Government of Ukraine. It aims to provide a set of recommendations and policy options to stimulate innovation activity in the country, enhance its innovation capacity and improve the overall efficiency of the national innovation system. Close collaboration with the national authorities and other experts from Ukraine throughout the project has helped in identifying issues of practical importance and in ensuring the relevance of the Review conclusions and recommendations to national circumstances. The Review provides a comprehensive assessment of the factors that drive innovation, paying particular attention to the linkages and relations between the different components and actors of the national innovation system. This integrated approach is well suited to the complexities of innovation and reflects a broad understanding of the challenges faced by policymakers. The Review will contribute to increase our knowledge of the impact of policies promoting innovative development and to the identification of good practices in this area that could be useful for other countries with economies in transition. The recommendations of previous Reviews have already played a positive role in informing new policy initiatives and have been followed by capacity-building activities to facilitate their implementation.